There are two ways of counting your data in Trevor. You can count unique values of a particular thing. What Trevor does behind the scenes is count the unique IDs associated with each of these entities. In the Calculations(s) section, click the plus icon. If you scroll down, you'll see count unique values of ... in the list of options. If you click this, you'll be able to manually select the thing you want to count. If you click the header of a given column, the third option down menu is count. If you click it, it will open the Calculation modal, with row count preselected in the Calculation(s) section and the name of the column you clicked on preselected in the Group by section. What row count does is count the number of rows that contain each of the unique values in a given column. count users by sign up date. count products by price etc. Once you've started joining multiple tables together, it becomes a little trickier to use the row count function. For example, if you join your Users table, your Transactions table, and your Products table, you'll most likely end up with multiple rows per transaction and per user (assuming that a transaction can contain multiple products and a user can have multiple transactions). 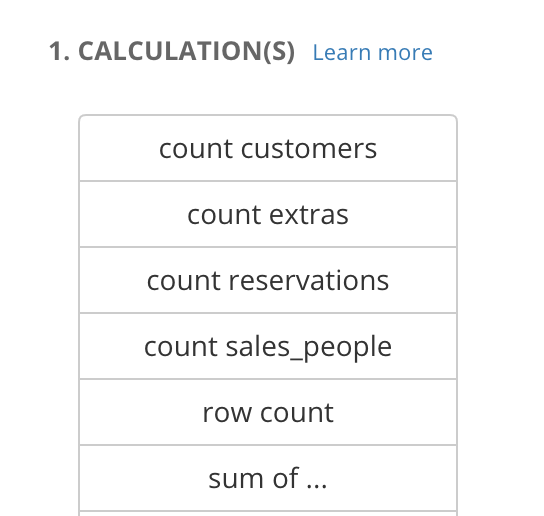 Using row count at this point to, say, count your customers, will produce the wrong answer because, as mentioned above customer information is now duplicated on multiple rows. You should therefore use the count unique values of ... option.